Anglers wishing to fish for Giant Snakehead in the wild and unexplored natural Dams and streams of Northern Thailand will be picked-up from Chiang Mai airport or their Chiang Mai guest house/hotel by a Fishsiam representative and transported to our site in the River Ping National Park. After a 3.5 hour journey through spectacular scenery the angler will be greeted by the extremely scenic Ping River National Park one of Thailands most beautiful rural landscapes.The Ping River National Park in Thailand covers an area of some 1,003 square kms and offers visiting anglers spectacular scenery with vast limestone peaks and dense green rain forests which are inhabited by a whole host of exotic animals. Wild Boar, Gibbons, fishing cats and Asian Black Bears are all found in its lush green jungles in addition to a myriad of flora and fauna. The River Ping National Park in Thailand offers fantastic opportunities for lure fishing fans to immerse themselves in a jungle setting whilst trying to catch one of Thailands most sought after native predatory species. The intricate web of streams and rivers leading off of larger reservoirs are a haven for Giant Snakehead and other native species such as Mahseer and Hampala Barb making them the ultimate destination for a Giant Snakehead fishing holiday. Thailand Snakehead Fishing at the River Ping is highly demanding requiring anglers to work hard for every fish and constantly assess their tactics. Captures from this beautiful part of Thailand are highly satisfying and a testament to their determination and adventurous spirit. The itinerary for our trips to the River Ping National Park is listed below. After a light lunch the angler(s) will visit various areas of the lake with the exclusive use of our onsite boat complete with boatman. The angler(s) will be equipped with all equipment necessary for the days angling – Spinning rod, Reel, leaders and a selection of different lures. The angler(s) will be accompanied by a Fishsiam Pro-guide and will have the exclusive use of an authentic engine powered Thai boat captained by a highly skilled local boatman. With the vast size of the Lower Bhumipol Dam region the angler(s) will be required to adopt a mobile approach during the expeditions angling. Using the local boatman and your Fishsiam guides expert knowledge the angler will explore the numerous bays and islands of this massive lake casting lures in search of the highly aggressive Giant Snakehead and Hampala Barb. The reservoir responds well to various techniques with poppers, pencils and buzz baits all producing on the right day and conditions. 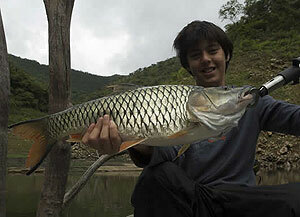 Fly fishing and baitcasting can also produce good results to anglers skilled in these techniques. The local boatman and your Fishsiam guide will transport you to various parts of the lake gently stopping the boat in likely holding areas so that you may cast into the submerged trees and structure. Carefully teasing lures across the surface near these submerged root systems anglers will be rewarded by explosive strikes from highly aggressive Snakehead, Jungle Perch and various other native predatory species. After fishing until dusk the angler(s) will be transported back to floating fishing bungalows situated on the lake for dinner and overnight accommodation. Angler(s) will commence Snakehead fishing at 5.30-6.00am and continue to explore the various parts of the reservoir with the aid of the local boatman. Floating bungalow River Ping National park ThailandAngler(s) will fish until 11.00am and will then return to the floating raft around noon for lunch. Giant Snakehead Fishing will commence at 2.30pm until dusk when the angler will be returned to the raft/bungalow for dinner and overnight accommodation. Snakehead Fishing will commence at 5.30am and anglers will fish until 11.00-11.30am before returning to the floating raft/bungalow for lunch. After a few hours rest anglers will be returned to Chiang Mai at 3.00pm with the journey taking approximately 3.5 hours. Fishing rafts/bungalows at the Lower Bhumipol Dam in Thailand are equipped with beds, fans and w.c allowing the angler to totally immerse himself in the spectacular natural surroundings. 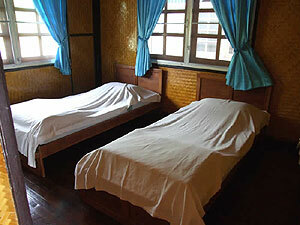 It is also recommended that you bring, during the raining season (June-October), wet weather clothing along with you. 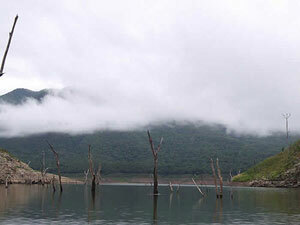 Snakehead Fishing at the Lower Bhumipol Dam in Thailand is suited to experienced anglers with a sense of adventure. Our team of highly experienced guides have excellent local knowledge giving the angler the highest possibility of success. With the wild and vast nature of the venue and the constantly changing fishing conditions it is recomended that you contact us with regards to the best times to visit this venue. Tours are exclusive for max. 2 anglers per Snakehead fishing trip, booking has to be completed 6 weeks in advance. The River Ping National Park in Thailand can be combined in one of our Thailand multi venue fishing hoilidays or alterntively on a three day Snakehead fishing holiday.